No trimming! No shaping! Embrace the Whiskerino! 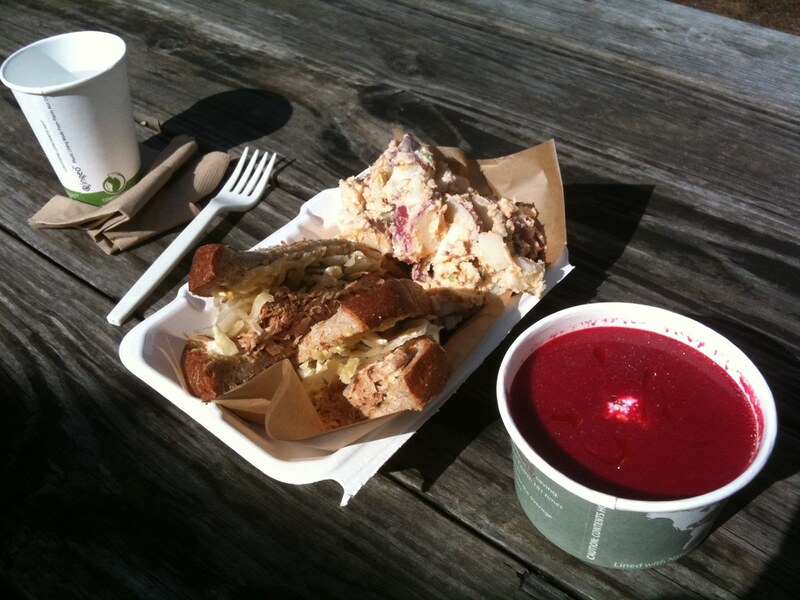 My current favorite lunch spot in Athens is the Farm 255 Farm Cart. Farm 255 is the in-town restaurant for Full Moon Farm, a sustainable farm just outside of town. Their dinners are great and affordable, but they're recently started serving lunch outside from a small wagon just big enough to hold a legal kitchen. The menu changes daily and depends solely on what's available from their farm and the other area farms they source ingredients from. And their lunches are even more affordable than their dinners. The porkwich not only sounds delicious, it is also an awesome name. Why did I never know this about Athens? @YogiBeard I had the porkwich, and it was delicious. Pulled pork, dijonaise, and sauerkraut on toasted whole wheat. Also, I added a side of potato salad and a bowl of beet soup. @ewagoner, that place sounds awesome and i would love to have a porkwich (or anything else on that menu). i think i could get beet soup here, but nothing else that's on that menu. i miss going to restaurants and getting affordable and delicious food. @fincannon I was about to ask where in the heck were you that you can't find an egg & cheese biscuit, but then I saw... Azerbaijan. I used to teach Geography, and I was pretty good at it, but I'd be hard pressed to describe what sort of food one might commonly find in Azerbaijan. awesome. seems like something that you'd find in Asheville. I'll be sure to check it out next time i'm up there. All of that sounds AMAZING. I'm going to go ahead and take a gallon of the Sausage Tortilla soup. Thanks. @thatguy The "tortilla" is a Spanish tortilla, which is much more like a frittata. I don't have a photo of theirs, but clame for one that looks close. It's one of the best deals on there. Ohhh! Then I will have six of them please. and yes. It's still for here. It only costs $1 to add steak to your Caesar Salad!?!?! I want to go to there. I've yet to eat there, but I plan to when I get some moolah (someday). Holy crap is your beard looking good. I'll have to hit this place when I visit Athens. Great location choice ewagoner! have an extra serving for me will ya!! I'm liking that shirt too! Father, Husband, Farmer, Software Developer. But mostly? Nerd. All photos self portraits using an iPhone 3GS or the occasional iSight camera on a MacBook, unless otherwise noted.